Today’s post is from Bruce Lesh, a high school teacher in Maryland and author of “Why Won’t You Just Tell Us the Answer?”: Teaching Historical Thinking in Grades 7-12. Excerpts from The Memoirs of Herbert Hoover: The Great Depression published in 1952. Excerpts from Douglas MacArthur’s Reminiscences, published in 1964. Statement to the press by General MacArthur, July 28. Over the years, my instinct about The Bonus Army has been rewarded with students investigating the evidence, applying that evidence to the overarching historical question, and developing interpretations substantiated with information derived from the evidence. Marchand’s Documentary Source Problems are the instructional forerunner of much of the work that has been done in history education. I still frequently find myself accessing the site for information, sources, and inspiration. My only regret is that I never got to meet Roland and pick what must have been a brain bountiful with ideas about inspirational history instruction. Every major measure of students’ historical understanding since 1917 has demonstrated that students do not retain, understand, or enjoy their school experiences with history. Bruce Lesh believes that this is due to the way we teach history — lecture and memorization. Over the last fifteen years, Bruce has refined a method of teaching history that mirrors the process used by historians, where students are taught to ask questions of evidence and develop historical explanations. And now in his new book “Why Won’t You Just Tell Us the Answer?” he shows teachers how to successfully implement his methods in the classroom. Why Won’t You Just Tell Us the Answer?” is available from IndieBound, Amazon , or directly from Stenhouse. This entry was posted in Historical Investigation and tagged Bonus Army, book, Great Depression, pedagogy, strategies on February 21, 2012 by jbcosca. 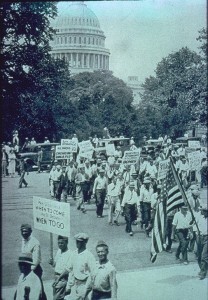 The Library of Congress’ recent blog post “Occupying” the Bonus Army Protests of 1932 got History Project staff very excited. One of the treasures left to us by the late Roland Marchand was his collection of “Documentary Source Problems” which were digitized and launched on-line as Adventures in Roland Marchand’s File Cabinet in 1999. His lesson The Bonus Army in Washington provides context and has students investigating whether the actions taken by the Veterans to occupy the mall in Washington D.C. were a “courageous defiance of lawlessness and a budding revolution” by analyzing documents from the event and considering questions such as: “Was there clear evidence that a Communist-led revolution was in the making,” “Was the Hoover administration trying to provoke a conflict by ordering the eviction of the veterans,” and “Did the clashes between police and the bonus marchers on July 28 amount to an actual riot?” We suggest that current events including the “Occupy” movement in the US as well as protests in the Middle East provide ways for students to make connections to this event from the Great Depression as well as other protest events throughout history. These protest events provide avenues to discuss how and why citizens seek redress and why this may or may not lead to change. We invite you to peruse this documentary source problem and share your thoughts about using this approach in the classroom with us. The Bonus Army lesson, which has been adapted for high school students, is also available in its original format for use with university students.